The Tyrrell – Ford Cosworth P34 n.3 is a car that participated in the Formula 1 World Championship in 1976. Born from a project by Derek Gardner, the P34 was the only six-wheeled car to participate in a Formula 1 race The idea was to decrease the penetration resistance of the car. Goodyear gave a big support to the new project with smaller tires. 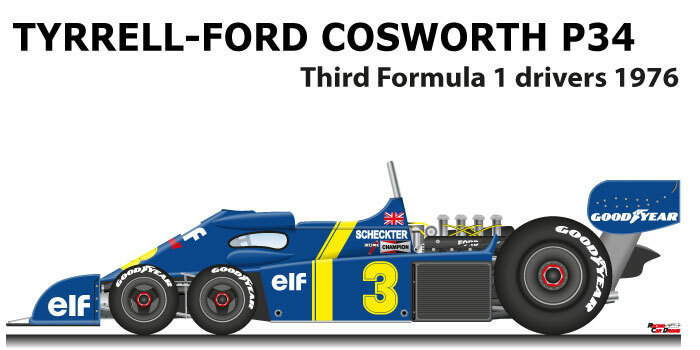 Jody Scheckter with the Tyrrell – Ford Cosworth P34 n.3 arrived third in the Formula 1 World Championship in 1976. The World Championship saw the challenge between James Hunt with McLaren M23 and Niki Lauda with the Ferrari 312 T. Scheckter during the season obtained many placings and a victory at Anderstorp in the Grand Prix of Sweden. In the Scandinavian race the English team got a double with the twin car driven by Patrick Depailler. Tyrrell finished third in the constructors’ championship at the end of the season. GP winner: GP of Sweden 1976.